With a collection of 21 albums it’s no wonder Gary Hoey is listed as one of the top 100 guitarists of all time. His latest album, “Neon Highway Blues,” just released in March debuted at #2 on the Billboard charts. The world renowned rock guitarist’s first break came in 1987 when Ozzy Osbourne liked Hoey’s tape enough to fly him to LA for an audition and encouraging him to move to the West Coast. In 1990 Hoey was signed to Reprise Records with a short lived band called Heavy Bones but followed up in 1993 with a solo album and Gary’s cover of “Hocus Pocus” rocketed into the Billboard’s Top 5 Rock Tracks. He went on to score the successful “Endless Summer II” soundtrack for New Line Cinema and in 1995 started a trilogy of “Ho!Ho! Hoey,” a collection of instrumental Christmas classics that continues each year in his Rockin Holiday shows. And in 2013’s “Deja Blues” he came home to the blues. Gary’s release in 2016, “Dust & Bones,” displayed an exuberant fusion of blues and rock. 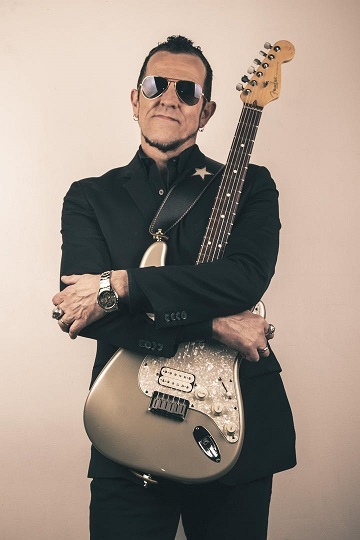 But whatever style he plays, one thing is certain, Gary Hoey is a fiery, charismatic player who connects with the crowd.